Originally published under the title "Middle East Rivalry between Iran and Turkey Interminable." 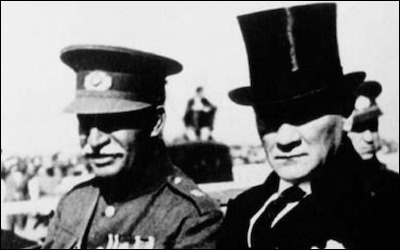 Ruthless modernizers: Iran's Reza Shah (left) and Turkey's Mustafa Kemal Atatürk in 1934. News that Iran's and Turkey's governments reached an accord on Idlib, a Syrian town now the focus of American interests, brings relations between two of the largest and most influential states in the Middle East momentarily out of the shadows. Their rivalry goes back a half-millennium, included eleven wars, and now remains, in the words of the Washington Institute's Soner Cagaptay, the region's "oldest power game." What does the recent accord signify and how will their competition influence the region's future? The current leaders, Iran's Ali Khamene'i and Turkey's Recep Tayyip Erdoğan, enjoy near-absolute power and both feverishly try to hide this reality under a large and noisy apparatus of elections, parliaments, cabinets, laws, and NGOs. Both aspire to lead the entire Muslim community, perhaps someday claiming to be caliph. In an era of muted anti-Zionism from Arab states, Tehran and Ankara now lead the charge, with the Islamic Republic of Iran loudly denying the Holocaust and the Republic of Turkey comparing Israelis to Nazis. 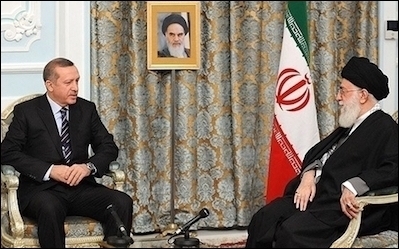 Even more ruthless Islamists: Turkey's Recep Tayyip Erdoğan (left) and Iranian Supreme Leader Ali Khamene'i in 2012. In several ways, Iranians lead Turks, but the latter are catching up. Ayatollah Khomeini came to power in 1979 and Erdoğan in 2002. Iran has long enjoyed massive oil and gas reserves but Turkey recently built an impressive economic base. Tehran deploys forces abroad, dominating four Arab capitals, while Ankara still fights domestic opponents, especially Gülenists and Kurds. Both governments despise the West but Iran's is openly hostile while Turkey's formally remains in NATO and ostensibly seeks European Union membership. Khamene'i's thugs capture American sailors on the high seas while Erdoğan's take residents hostage. Conspiracy theories, long an Iranian art form, have made huge strides over the past two decades in Turkey, which may now boast the region's most fantastical speculations. Both became enthusiastic allies of Venezuela's dictator, Nicolás Maduro. As head of a longer-established dictatorship, Khamene'i can allow relative freedom of expression compared with Erdoğan's obsessive desire to control, including what basketball players in the United States say or what travelers transiting through Istanbul airport think. Their most major difference concerns the attitudes of their subjects. Whereas Khamene'i enjoys the support of only about 15 percent of the populace, Erdoğan can count on some 45 percent, affording Erdoğan a legitimacy and confidence that Khamene'i can only dream of. 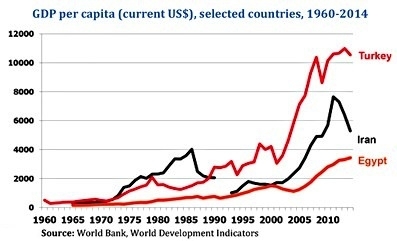 In part, this results from longevity under Islamist rule, in part from difference in per capita income, which is only US$4,700 and stagnant in Iran, $10,700 and rising in Turkey. Regime collapse in Iran is within sight and will diminish Islamism, encouraging Muslims to move toward a more modern and moderate form of their religion. The Turkish government's greater popularity and more advanced version of Islamism gives it greater staying power that makes it the more worrisome long-term opponent. Thus, the Middle East is likely to witness a grand switch, with Iran on course to moderation and Turkey becoming the region's supreme danger. The greater staying power of Erdoğan's Turkey makes it the more worrisome long-term opponent. Bilateral relations flourished during the first years of Erdoğan's rule (2002-10), when they shared an Islamist worldview and a suspicion of U.S. intentions in Iraq. But relations then soured, primarily because both regimes seek foreign influence and, as neighbors, they inevitably clash. The civil war in Syria, where Tehran backs Shi'ite-oriented jihadis and Ankara backs Sunni jihadis, is their biggest but not only problem. Other matters also aggravate relations, such as their supporting opposing sides in Yemen, Turkish installation of a NATO radar tracking Iranian activities, and Iranian support for Al-Qaeda against Turkey. Tensions have reached the point that Ali Vaez of the International Crisis Group finds Tehran and Ankara "on a collision course." Left unchecked, he expects the present dynamics to point "toward greater bloodshed, growing instability and greater risks of direct ... military confrontation." More poetically, Cagaptay observes that the Middle East has room for "one shah or sultan, but not a shah and a sultan."